(L to R: Allie DeRocher and Jade Schultz) Wildcats get revenge on Cheboygan. Alpena, Mich. — The Alpena Wilcats caught a break from the Big North Conference Tuesday night at home against Cheboygan. The Vikings entered the match (1-11). Their only win was over Alpena 41-40 on a buzzer beater early in the season. The Wildcats started off hot with a (10-0) run and two first quarter three-pointers by Abbie Funk, but the Vikings attacked back and tied the quarter at 11-all. The green and white’s junior Jade Schultz knocked down her first career three-pointer in the second quarter, but the scored remained close as the Wildcats entered haltime with a three point lead. 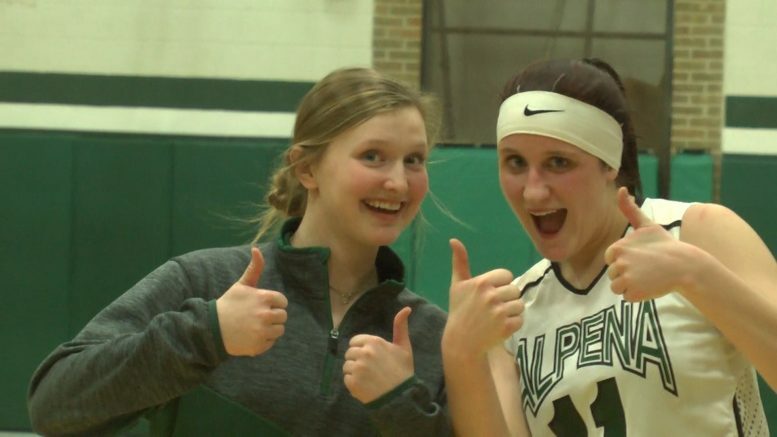 Alpena did not pull away until the third quarter, five different players contributing, outscoring Cheboygan 15-6 and taking the 44-32 lead. The Wildcats would only make 3 of 8 free throws in the fourth quarter, but their defense helped secure the 54-42 victory improving to (6-6) overall. Up next Alpena takes on Traverse City West on the road Thursday, one of two teams ahead of the Wildcats in the Big North Conference.